South Coast rain gauges like Three Peaks and Mining Ridge have collected close to 10 inches of rain over the past 72 hours, but Santa Lucia streams, which were largely running at less than 100 cubic feet per second (cfs) before the rain began, have had no difficulty containing the runoff. 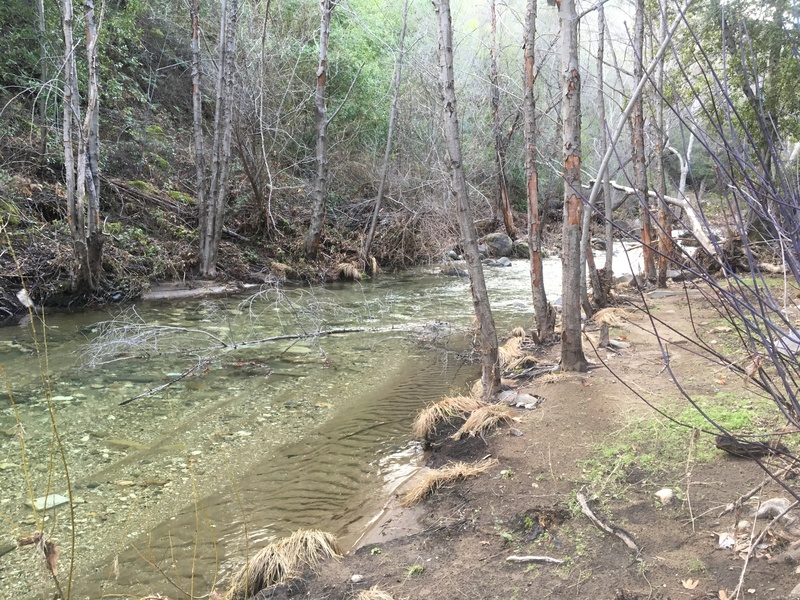 The Nacimiento River is currently carrying a little over 7,000 cfs. This isn’t much for a stream that sometimes produces flows in excess of 50,000 cfs, but it will still provide a much needed shot in the arm for Lake Nacimiento, which has already added over 15,000 acre feet to storage since Sunday and is now at 50% capacity. To put this in perspective, more water has been added to Lake Nacimiento in the last four days than the entire Monterey Peninsula consumes in a year. The Los Padres Dam on the Carmel River, for comparison, has a total capacity of only around 1,750 acre feet. 15,000 acre feet is, in short, a lot of water – until you compare it to the over 500,000 acre feet pumped from the Salinas Valley annually; water which Lake Nacimiento must attempt to replace. The Arroyo Seco River, meanwhile, is flowing at just under 6,000 cfs, and is also far from flood stage. A little under 3,000 cfs are flowing under Rosie’s Bridge on the Carmel River; less than a third the volume of last year’s 9,000+ cfs. The Big Sur River has slowly clawed its way above 2,000 cfs this afternoon; also well short of last year’s 7,650 cfs peak flow. The San Antonio River, at 1,550 cfs, is carrying the least water of the major Santa Lucia streams, which explains why Lake San Antonio has added only 625 acre feet over the past four days and remains at only 32% of capacity. This entry was posted on Thursday, March 22nd, 2018 at 4:16 pm and is filed under Big Sur, Carmel River, Fire, Flood & Apocalypse, Santa Lucias, Water. You can follow any responses to this entry through the RSS 2.0 feed. You can leave a response, or trackback from your own site. Great report. I wondered how we are doing and you filled in the blanks. Many thanks. Heard Los Gatos was 1/3 full.